A Raised Garden Bed for a Pear Tree! Ok. Ok. So you maybe Wendy Irwin didn’t start Yellow Tractor so people could grow pear trees, but she did start it because she felt it was the first step toward a healthier nation and a healthier world. We are featuring Yellow Tractor’s smallest raised bed, a 2′ x 2′ x 12″ Herb Box, built from sustainably-raised Western Red Cedar. It is absolutely beautiful and is perfectly suited for a front entry or back deck/porch location. Herbs or salad greens grow especially well in this size, and it is also gorgeous in front yardscapes. Yellow Tractor gardens are always accompanied by one complimentary year’s subscription to their mobile education, The Scoop. The Scoop comes out monthly, is tailored specifically to your garden zone and features top “to-do’s” for your garden, as well as deeper education, recipes, facts and tips. Sign In | Favorites 2′ x 2′ x 12″ Raised Garden Bed Kit Yellow Tractor™ western red cedar raised garden bed. 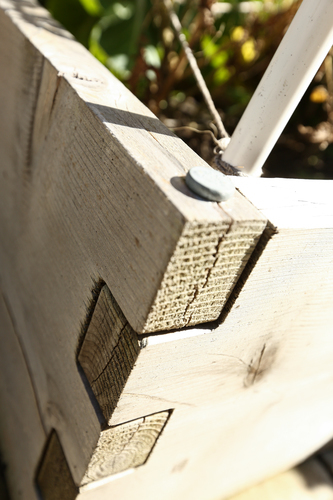 Includes (4) 2’ western red cedar boards, (4) galvanized pins. Easy assembly. No tools required. Garden beds that can go on any surface. BUY IT & GIFT IT! Meet Wendy Irwin, the founder of Yellow Tractor! Yellow Tractor believes everyone can and should have access to healthy food. That’s why every Yellow Tractor garden bed purchase helps support garden projects through their nonprofit, The Yellow Tractor Project. The Yellow Tractor Project expands our commitment to improving health by partnering with organizations in underserved communities and unexpected locations to cultivate healthier lifestyles. Grow good food… so others can. Why do we like this gift? WE LOVE MAKERS! AND – We are all about making good go further. Making the greatest impact with your time and your money. Your purchases are like small investments in the businesses these women run. Please patron fellow women owned companies – next to shopping local, it’s a sure way to see change. We drive the buying decisions – we are the next legacy, ladies. Or check out the previous gifts featured in #StartupMs!